NOTE : This guide is now out of date - I dont have any Bethesda games installed anymore, and xEdit has changed greatly since I last had it installed. 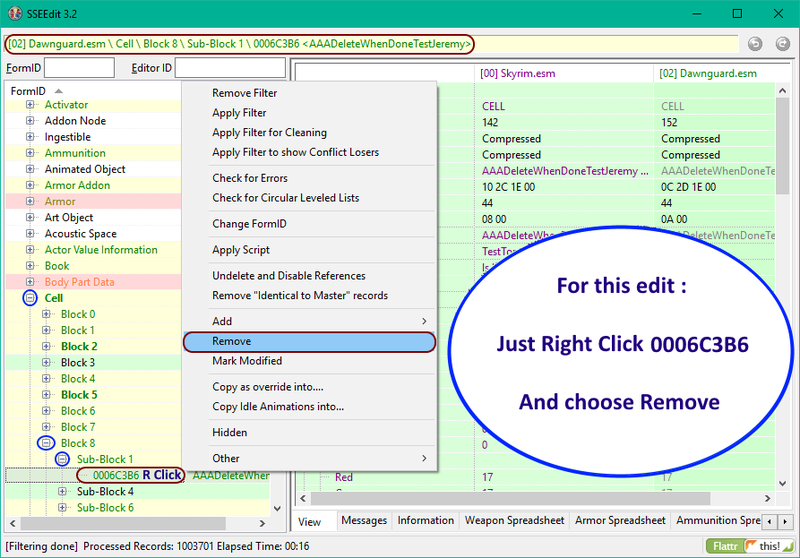 Due to this guide being dual purpose ( For Skyrim and Skyrim SE ) for the rest of this guide I will refer to both tools as xEdit. Screenshots of tools used may be one or the other, or older versions, which does not matter, the images are only to illustrate the method / options used. Why Clean the Master Files ? Firstly because the masters have entries that are identical to the same records in Skyrim.esm or other DLC esms'. They exist because Bethesda may have looked at something in the CK and an unneeded entry was auto included in the plugin even though the item was not altered in any way. The Official Creation Kits are notoriously buggy and randomly create dirty / wild edits, often when the author of the plugin is completely unaware. 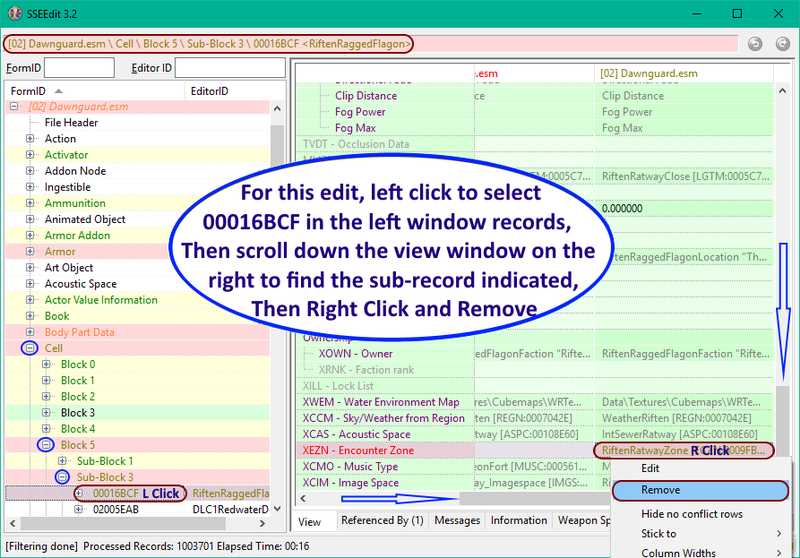 Wherever that plugin is placed in your load order its records overwrite all the conflicting records from plugins loaded before it ( the rule of one ) resetting the settings back to the values contained in the Official Bethesda DLC. It won't cause crashes, it just changes the values of plugins loaded before it. Which can alter mods that you have for Weapon Damage, Armor, Lighting, Food Effects and so on. The masters are very early in your load order but there is potential for a mod to be made as a fake.esm, and placed among them, and so ITMs in a later loading master may cause problems for that mods esm. 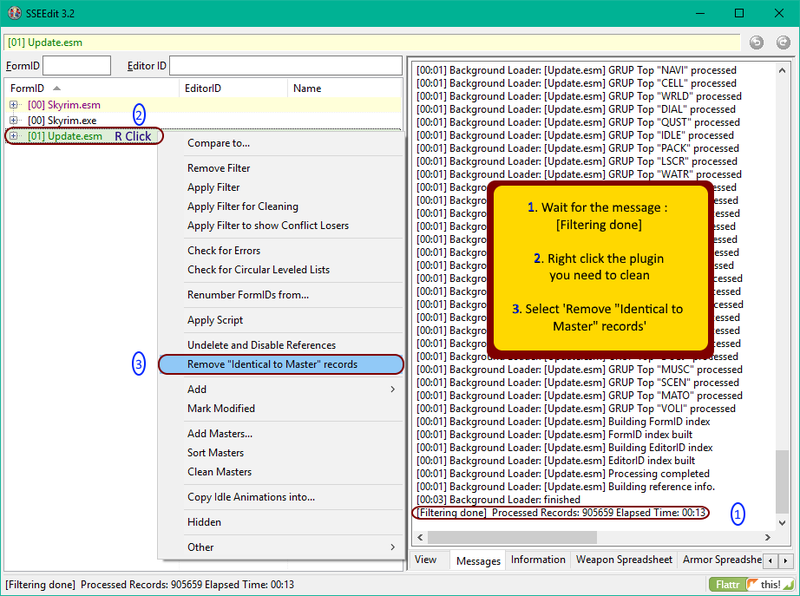 Chance is remote that a master will affect another master, and this procedure is best used on all of your mods plugins, but cleaning everything of ITMs ( Identical to Master records ) causes no harm, is more optimal giving the game less to process in your load order, and so it is best to get rid of these completely unnecessary dirty edits. The Second reason is that Bethesda chose to delete some things that are in the Official DLC. Any mods loaded with references to deleted records from the Official Bethesda DLC will cause your game to crash. This problem particularly affects older mods ( especially mods that were made before newer official patches were released, with more deleted references the old mod did not anticipate - It will also become problematic for the Skyrim Special Edition community where old Original Skyrim mods are being converted to SSE, and Bethesda have deleted even more records from the plugins before they released the newer plugins for that version of the game ). xEdit can restore and properly assign values to these records that will disable them and still allow mods to access them. This is done using the "Undelete and Disable References" option. Zilav and Arthmoor, most valued technical and vastly experienced modding authors, weigh in on the subject. Manually cleaning your mods is also important to remove wild edits. 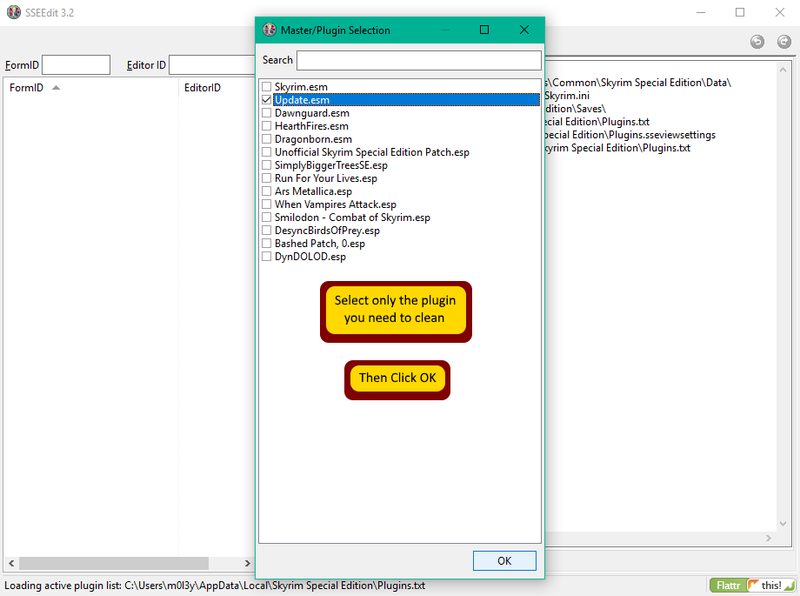 This is mostly down to the experience of Mod Authors to solve such problems, but there are a few noted later in this guide which are in the DLCs which everyone can easily Manually clean. Some mods can have accidental Wild Edits in them caused by the author looking at how Bethesda did something they wish their mod to do as well. These Wild Edits often prevent Skyrim from doing things like advancing quests, spawning NPCs, assigning dialogue to NPCs, preventing NPCs from patrol areas they are assigned to. They can also alter Vanilla Lighting and Triggers that the author wished to use. All of these things affect any plugin with conflicting records loaded before a mod with Wild Edits. 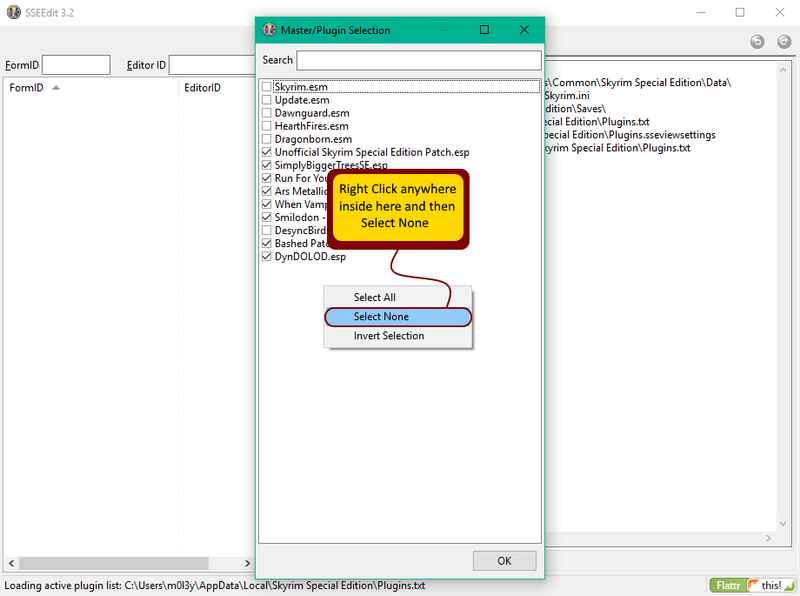 Mod authors - Learn to use xEdit, and ensure the only records in your mod plugins are what you would expect to be in there, its the most important tool the community can make use of when used properly. 1. Right click the plugin selection screen and select "none"
3. Right click the plugin after you get the "Background Loader : Finished" message,and choose "Apply Filter for Cleaning"
Wait until Filtering is finished then .. 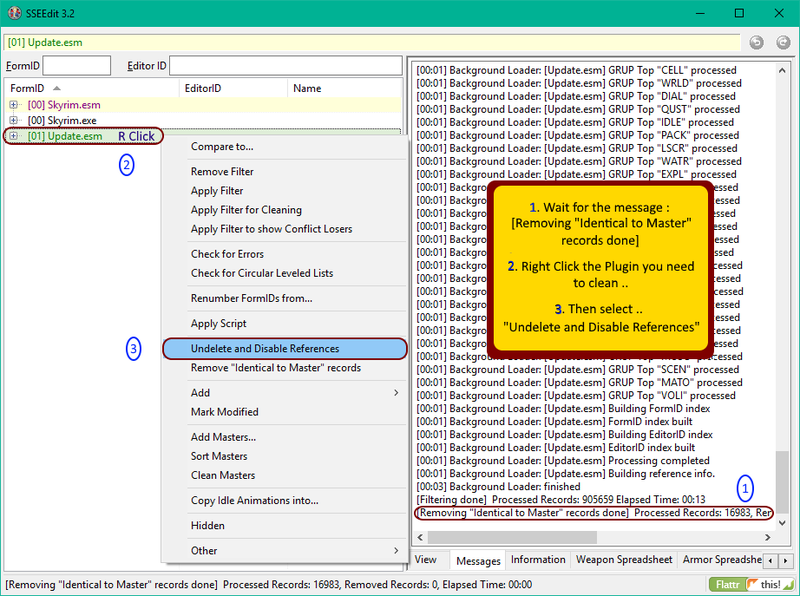 Wait until it finishes then ..
Rinse and repeat the Automatic cleaning ( steps 1 - 6 above ) for each of the master files. 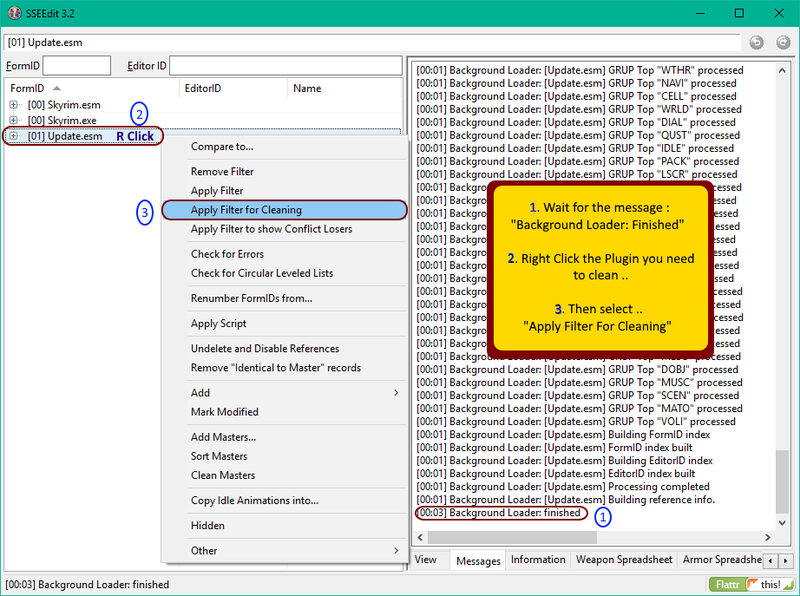 After its finished loading, right click Dawnguard.esm and choose "Filter for Cleaning"
NOTE : This guide used to include cleaning instructions for "CELL 00039F67: Wild edit. Remove this record. 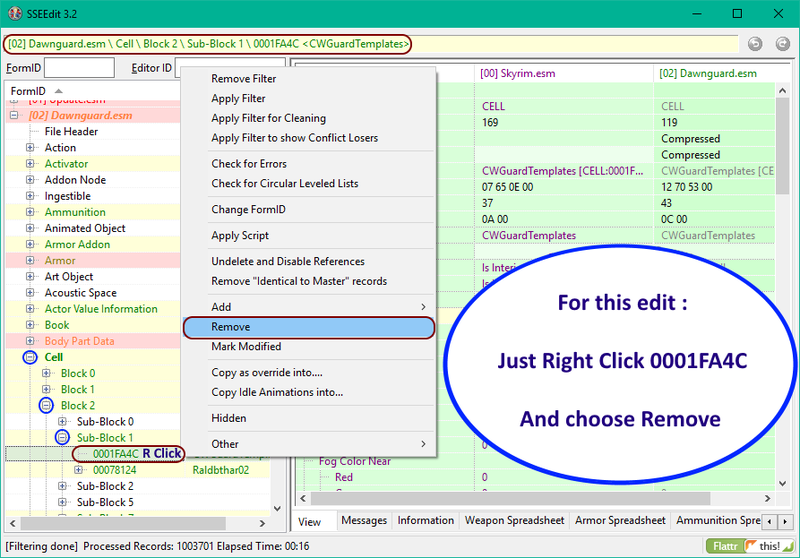 It's a testing cell" ( The WICourier edit ) - But since the new version of TES5Edit 3.1+ now cleans that as part of the automated cleaning ( which you should have done prior to manual cleaning ), you no longer need to clean it manually afterwards. Now that the Master files are cleaned, you could put them in a zip, and get your mod manager to install them - Maybe at a future date you want to do a refresh of steam cache and it redownloads the masters which are not the same as the originals anymore (because you cleaned them), so then you would need to reclean them again. But beware, Bethesda have started redoing some masters due to Creation Club mods compatability, so make sure any redownloaded masters are not newer than your previously cleaned ones, because in that case you will need to reclean and rezip them again anyway. You can go through the rest of your Load Order using Automatic cleaning of ITMs and UDRs on all your mods plugins. The sequence of cleaning mods plugins should be after you have your Load Order correct, masters are cleaned, then clean them with the last to load being the last to clean. Mod authors should have done them already, so most will probably not need cleaning. Also look out for any mod specific cleaning instructions in the mods description. Prime example = The Unofficial Patches will not need any cleaning, they are already done, and any remaining ITMs in those plugins should be left alone because they do have a purpose .. ( its a very rare occasion when this is true ). And newer versions of xEdit (3.2.7 +) have a link to Discord top right of xEdit window. Edited by alt3rn1ty, 02 April 2019 - 01:30 AM. Edited by alt3rn1ty, 21 February 2017 - 09:21 PM. Thank you very much, for this. Thank you - very helpful indeed. I just got the forced update, and the first thing I did was clean my masters. I'm coming up with different numbers. Not sure what/how much they changed, but thought I'd pass it along. Currently I am using the latest development version on afk mods (at the bottom of the first post is a "Download" link). With that in mind here are my results, which I have carefully checked using the dev version of 3.2.1 - But only for Skyrim Special Edition (as explained above). Thank you for this guide, very helpful! A mod that installed loose 'strings' files was causing the issue for me. Just removed them and cleaned again, all numbers match up now fine as posted above. Added mod back in again to check, went to clean a back up of the uncleaned esm's again, numbers were off again. Thanks for the updated info. Is anyone else getting different results though when using xEdit 3.2.1 Dev Beta Build? Both Update.esm & Dragonborn.esm give me different results to those above (marked changes in red). For the longest time I thought this guide was made by the team that made SSEEdit. Well, I was just informed by Sharlikran that this is not the case. Still thank you do much for the effort. I await for the official update. Just realized you posted your updated result here. Thank you so much! Edited by yian, 27 November 2017 - 09:22 PM. This came up just as I was loading in SSE Edit Thank you! home for multiple followers/companions suggestions? Issues with Mod Organizer 2, unable to play anymore.